(Out of 12,356 psychiatrists polled with 2,417 total responses). Fallout- Goldwater sues for libel and wins after the 1964 election. 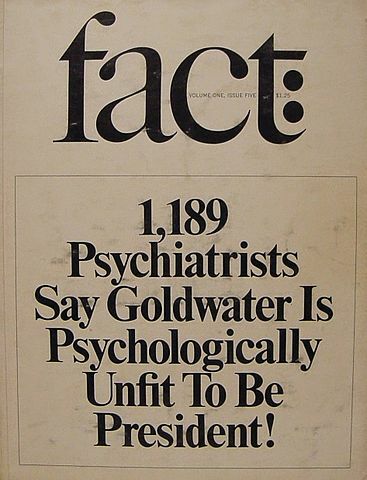 In 1973, the American Psychiatric Association (APA) implements the “Goldwater Rule” in response, the principles of which the American Psychological Association (also, APA) “wholeheartedly agrees.” (Side note: APA style is Psychological). Richard Hofstadter’s famous catch phrase, the “paranoid style in American politics,” should be buried with a stake in its heart. As someone who has tried to hammer in the stake for several decades, I can’t help noticing that the term has again risen from the grave as in a horror movie populated, not by vampires, zombies, and terrified teenagers, but by Donald Trump, superficial pundits, and terrified liberals and radicals. Application of the ‘paranoid style’ to Trump and his followers began in 2015 and has continued unabated. Some of Trump’s conservative defenders have retaliated by calling his critics the true paranoid stylists.